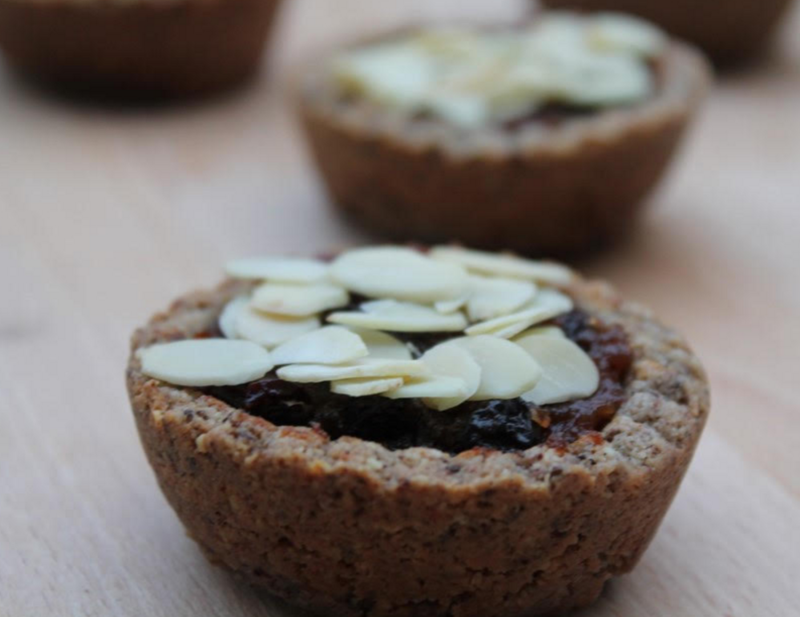 A wonderful alternative to the traditional mince pies. For more perfect Vegan, Gluten Free, Refined Sugar free alternatives, go to RECIPES. In a small bowl, combine the orange zest , lemon zest and grated ginger with the Maple syrup and a pinch of ground clove. In a separate bowl, combine the Raisins, Currants, Orange Juice and Cinnamon. In a separate small bowl. Mix the Chia Seeds with water and reserve. This will make the chia become a gel. Stir again after 15 minutes, making sure all the chia is absorbing water. Process in a food processor, until very fine, or grate it. Mix the preparation number 1 and 2, with the apple and nutmeg and cook in low heat with the lid for 30 Minutes. Add 1 TBSP of water after 10 minutes, and another TBSP of water after 20. Keep an eye if is not going dry, and add a splash of water if necessary. Combine the almonds, ground almonds and vanilla in a food processor, and process them until almonds have been crushed, leaving the smallest possible bits. Add the coconut oil and chia seed ‘gel’ and process until well combined. It will become a ball of dough inside the processor. Shape the dough with your hands, initially as a ball, and then spread it into a rectangle shape, in a surface covered with baking paper. Cover the dough with another baking paper and roll the crust with a rolling pin, until flat and around 0.5 – 1 cm thick. Use a pastry cutter to cut the dough and shape them into a previously greased (in coconut oil) mini muffin tin. You can repeat step 4 as many times as necessary, reshaping the dough and cutting more bases. Fill them with around 1 + ½ tbsp of the mince meat and bake in a pre-heated oven at 150°, for 20 -25 minutes, until golden brown. When the crust is almost finished, cover the pies with around ½ tbsp of almond flakes and let it brown for 4-5 minutes.